Getty/Paul MarottaKanye West fans standing in a circle showing off some early Yeezy shoes. On Wednesday Kanye West tweeted several statements in support of Donald Trump, including one message where he said he loved the president and another of a picture of a signed red Make America Great Again hat. Many fans took issue with his comments, tweeting that they felt betrayed. Some claimed they would no longer want anything to do with the rapper, and said they will be selling his Yeezy shoes. Pairs of Kanye West’s Yeezy shoes might be about to change hands quickly. Fans upset with West’s Twitter antics have started claiming they will sell the shoes in protest on the social network. West went on a lengthy Twitter rant on Wednesday, claiming he “loves” President Donald Trump and posting pictures of his red Make American Great again hat signed by Trump. In protest, some have gone as far as to offer the shoes for sale for “retail” – or the exact price they paid. It’s unclear if the fans are acting out of anger and actually intend to sell their shoes. Some Twitter users were selling their shoes because West’s comments made them wary of wearing their shoes and implicitly showing support for West’s supportive Trump comments. 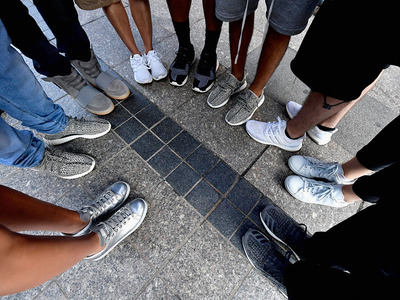 Other Twitter users saw the funny side in the backlash brewing against West and his shoes. Some predicted the resale market for the shoes – which currently can demand upwards of thousands of dollars – would crash unceremoniously. Others were just hoping to snag a pair of Yeezy shoes for a lower price from one of the people claiming to be selling them. This isn’t the first time West has hinted at his support for Trump. West took a meeting with then-President Elect Trump at Trump Tower in 2016. West said on Twitter he took the meeting to discuss “multicultural issues.